Cooking and baking is one of my favorite hobbies. When I found out I was going to be studying in Florence for four months, I was excited to learn about the history and culture of the city, but I was most excited to learn about the pizza, pasta, and gelato. One of the first things I did when I got to Florence, was sign up for a cooking class.I learned to cook classic Italian dishes from a woman who has lived in Florence for 45 years. Eating the classic Italian food became a huge part of learning about the Italian culture. I made it my goal to try something new every time my friends and I ventured out of our apartment to go out to eat. (My only exception was that sandwich at Antico’s, I seriously think I could live off of that roasted red pepper spread and the fresh mozzarella.) I had never experienced the passion and care that everyone was creating with their food. It did not matter if it was a street vendor or if I was in a fancy restaurant, everyone cared about the product they were producing. 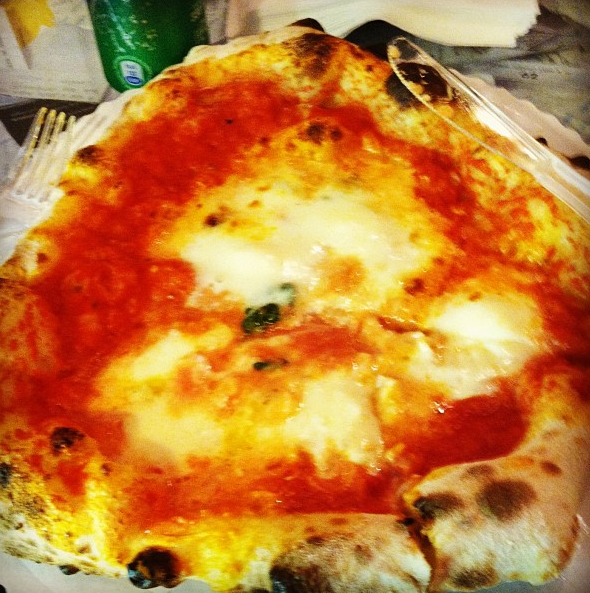 I cannot remember eating anything in Italy that I did not like. One of the perks about living in Florence for four months was the convenience of traveling around Europe. (Which America should really get on board with.) Anyway, because of Florence’s central location, going to a different country every weekend was the norm. I took the same motto about food when traveling abroad. I learned about each country through a dish that was representative of them and saw how they presented themselves. Here’s a collection of some of the top dishes I ate abroad. Nutella is basically the peanut butter of Europe, and I was very okay with that. Only being in Amsterdam for a little over 36 hours did not give me all the time in the world, but enough to find my favorite food there. Everyone recommended that we find the “giant pancakes.” When my friend Jackie and I were there, we took a walk after spending a sullen morning touring the Anne Frank house. It was time for enjoyable pick me up in order to continue the rest of our day. We stumbled upon this small diner like kitchen. After looking in the window to get a peek at the meals, we were sold. I ordered a banana Nutella pancake and was not disappointed when it arrived. The pancakes in Amsterdam resembled more of a creep and the chef seemed to have a heavy hand when it came to pouring the Nutella. The chef finished it off with some fresh bananas, allowing for the perfect bite. It was simply delicious. 2. Rösti in Interlaken, Switzerland. Interlaken, Switzerland is the adventure capital of Western Europe, so I figured I had to do some adventurous eating while there. After a busy day of trekking through the snow and paragliding above the alps, (yes, living abroad was very difficult) it was time for dinner. We asked some of the guides at our hostel what the local food they recommended and they said rösti. The rösti was basically a giant hash brown served like a n omelet. It was a vehicle for other foods as well. The first one I tried was served with a mushroom creme sauce and some parsley. I was hooked. 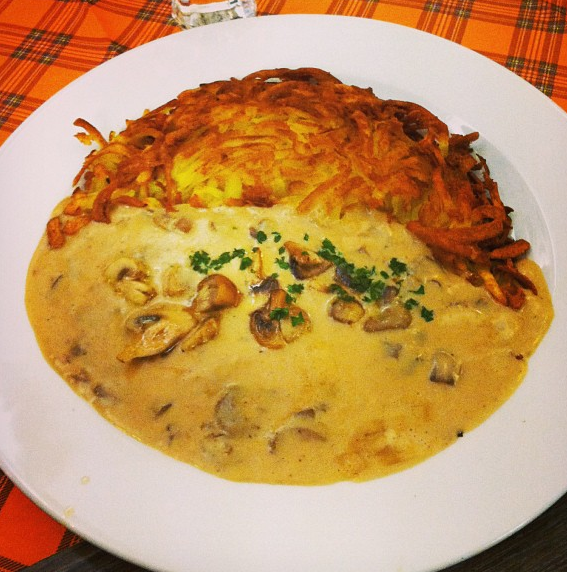 The last day we were in Interlaken, we went on a search just to have another rösti before we left. The second and final rösti I tried had been more of a breakfast variety served with pickled onions and shallots with a fried egg on top. America should really get on board with this food. 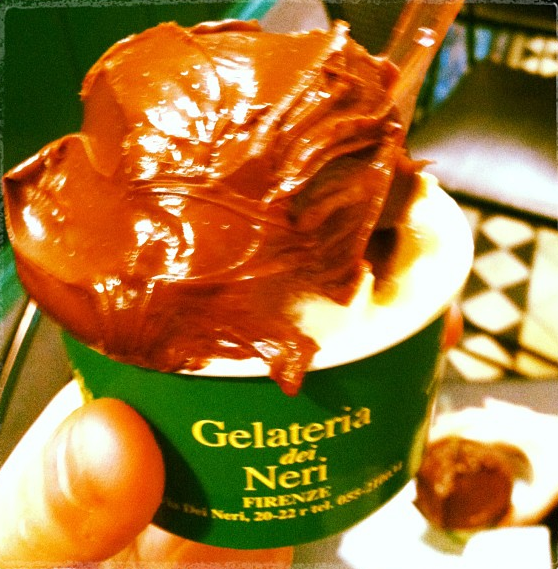 Gelato became a staple food group while eating in Italy. When I first arrived, I wanted to try every single flavor. I learned about the culture of gelato and even took a class on how to make the classic flavors. They even taught us what the difference was between homemade gelato and “tourist” gelato. (Hint, if it is a bright color, it’s probably not that natural…) My favorite gelato shop was on my way home from class and the last month I was in Firenze, my friend Alyssa and I thought it was okay to have a small cup every single day. I mean, when in Rome (or Florence), right?! I tried countless flavors and different combinations. 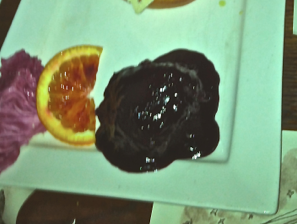 The strangest one I tried had to be chocolate chili and my two favorite flavors (because who can pick just one!) were Arabeschi Limón (basically the lemon girl scout cookie in gelato form) or the Raspberry/Cherry Chocolate combination. It was the perfect bite every single time. Split, Croatia was the vacation home for the Roman Empire. To me that basically meant that they combined the best food that Italy had to offer with the best seafood possible . And boy, was I correct. Over the weekend I spent in Croatia, I spent most of my time wondering the different islands and exploring the beautiful scenery the country had to offer. One of my favorite meals there was a simple pasta dish that my friends and I ate during an evening we spent in Trogir. We ended up at a classic restaurant, a little tourist-y, but it was getting late so we settled and decided to give it a shot. The menu was in a different language so pictures were our best options. I ordered a seafood pasta that was simply amazing. The pasta was perfectly cooked and the seafood was the freshest thing I had ever eaten. I could not even tell you what kind of seafood I was eating because the variety was that large. The pasta was just as fresh and cooked with love. It was the best mesh of food cultures that I have seen abroad. 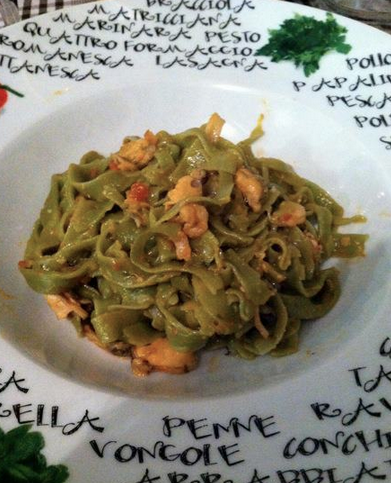 I quickly discovered what my favorite restaurant was in Florence after eating this dish. This restaurant was home to many of my favorite dinners that I ate in Italy, but I settled on the one that really stood out as an odd combination. I know what you are thinking just from reading the headline, why would someone want to put combine blueberries and steak? This is one of the strangest, but most delicious combinations ever. The steak was perfectly cooked at a nice medium rare, and the sauce was made with the freshest ingredients that Italy had to offer. It was smooth and packed with flavor, yet savory and sweet at the same time. If you are ever in Florence, take a trip to Aqua Al 2 and try this dish. You will not regret it. My last weekend trip abroad was to Munich, Germany. 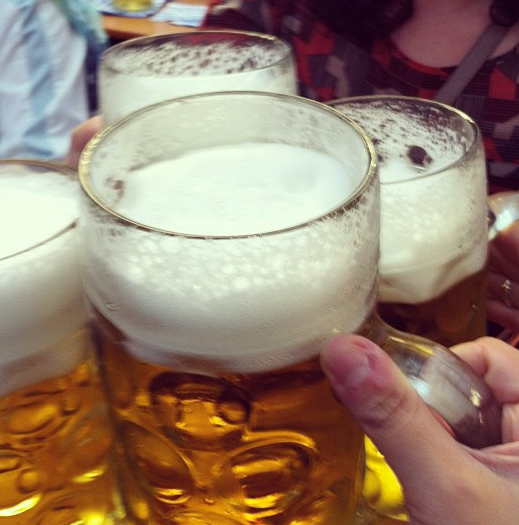 The beer festival, Springfest was taking place it was the perfect way to close up our semester abroad. The festival is basically a mini version of Oktoberfest. My group of friends and I found ourselves sharing a table with a local German family, in which they helped us get the most out of our Springfest experience. After a lot of beer, we decided it was time for some food. We asked them what they recommend and they told us to get Kartoffelknodel. Kartoffelknodel, is basically a German dumpling. It was made with a variation of raw and cooked potatoes, but it was delicious. The creaminess allowed the potatoes to melt in your mouth and the raw chunks added a nice bite to the dumpling. We finished those off with some Radler. Radler was a type of beer that has a splash of citrus juice to it. It was a strange combination at first, but the citrus elements complemented the heavy beer nicely. It was a nice offset to the many pints of beer we were drinking that day. I could continue to go on and on about the sampling of food that I tried in Europe and tell you all about my favorite sandwich shop, my local fruit vendor, or even where I bought my favorite balsamic vinegar. There is only one way to experience it for yourself, so go by a ticket, and get tasting! !